Shopping carts should make customers feel secure about more than just their credit cards. One of the jobs of a shopping cart is to make the customer feel that he is actually paying for the product he thinks he selected. I continually have this same problem (i.e. website-induced doubt) with shopping carts — either they don’t tell me what I am buying (so I wonder, “Gee, did I click the right button?”) or they give me just enough extraneous information to put some doubt into my mind. I probably would have been okay with the “unlock” of Quicken 2007, if it weren’t for the free download they threw in of Quicken Willmaker. 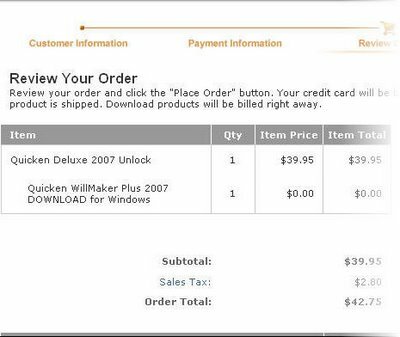 As soon as they called Willmaker a download, I knew that the other — the one I really cared about — wasn’t a download. In fact, only when I started writing about it that day did I figure out that I was only getting an “unlock” because I already had the software in my hands. I had to think too hard — they needed to call it an “unlock code for your software upgrade” or something more descriptive. Here, this one is even worse. I was making my registration at the hotel for the Emetrics Summit. It looks like a gorgeous hotel on Nob Hill, so I really wanted to stay there. I just didn’t want to spend $900. So I’m going to share a room with someone, to cut costs. But, when I got to the last screen, I was told that I would pay $40 per extra person per night. Eventually, I made my reservation the old fashioned way, and the customer service rep told me that the extra person charges apply to rooms with three or more people. So either the hotel needed to remove that information, or make it clear that the information only applied to rooms with 3+ people.